Or at least having tea with me. 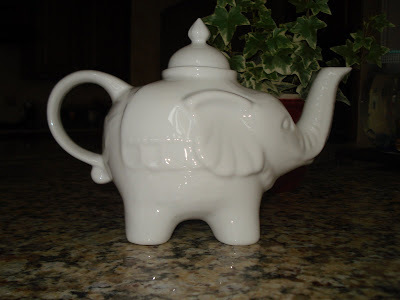 I found this little teapot at World Market the other day after breaking the lid on my favorite teapot (no lid=cold tea=yuck). Caleb loved him and promptly named him "Elvis" (after a brief attempt at "Ryan" which he quickly realized was not an appropriate name for an elephant). So on mornings that I don't have to do 200 things before lunch, I can have my morning tea with Elvis. This weekend I have high hopes for finishing up the last of the 2008 socks and I might even find the swift and ballwinder. (I realize I've been saying this for ages now, but somehow real life keeps getting in the way of doing what I want to do). I hope you all have a wonderful weekend! I've got to go run some errands this morning and I don't have much to show you knitting wise today anyway. Remember the book that's coming out this Fall from Lark Books that I got to design a pair of socks for? (It's a sock book, many designers designed socks for it.) Well, they've put together a little survey and the results will be in the book, so if you want to take the survey, click HERE. It's just a little survey about sock knitting and it will take less than 5 minutes if you're interested. 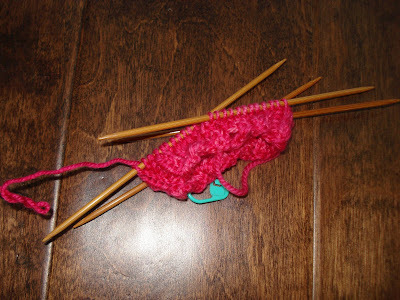 This is actually the leg of the second Visions of Sugarplums sock, but it looks like a pink rectangle. I didn't realize the flash had washed out the stitch pattern until I went to upload the photo and now I'm feeling too lazy to retake the picture. I'm down to the heel flap now, so I feel like I'm just about to the halfway point (I've always felt that once I start picking up stitches for the gusset after the heel turn, I'm halfway there). Since you've all seen better pictures of socks before, I'll update the fragrance search. Here is what I've discovered from the samples I ordered (scroll down to the post on 2-18 for the link to The Perfumed Court, where I bought the samples). Chanel Bois des Iles - This was beautiful, but smelled heavy and old fashioned to me. Glad I sniffed it, but it's just not me (or I'm just not sophisticated enough to wear it). Michael Kors Island - nice, but it reminded me a bit of dryer sheets or room fragrance. Narciso Rodriguez For Her - it smells just like Lovely to me. I'm sure there are a few differences but I'm not picking up on them. I knew they were similar when I decided to try them out, but I wasn't expecting them to be quite this similar. Bulgari Au The Vert (Green Tea) - I really liked this one, but it disappeared in under 30 minutes. No clue where it went, but I'm not reapplying fragrance every 20 minutes. Bulgari Au The Blank (White Tea) - LOVE IT! This is definitely a keeper and I'll be ordering a bottle of it. It doesn't really reach out and grab people across the room, but it's better behaved and stays close to me. Caleb and Mickael both really like it (Caleb gives it 2 thumbs up and says it smells great and it's his favorite). That's where I'm at on the fragrance search. Thanks to Moiraeknittoo's comment from last week about Black Phoenix Alchemy Labs, I have spent several hours wandering around their website. They have what looks like a wide range of scents, from more traditional types to some that I would have never thought of wearing (one of their fragrances is described as the scent of utter hopelessness). I'm thinking about trying out a few of their scents as well, but I have no idea where to start. Anyone who knows their fragrances a little want to offer suggestions for trying out? I'm currently considering Embalming Fluid, Snake Oil, and Morocco, but I'm open to other suggestions as well. And if you're curious about BPAL, go check it out, but make sure you have some time to wander the site (and if you're at work, you might rethink it since some of their art might not be appropriate for your workplace - don't want anyone getting into trouble). Here's a link. I promised something new to look at today, but it's not really new. These are the fronts to Juno and I about doubled their size over the weekend. 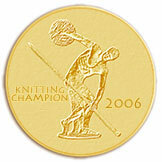 This is a K2, P2 rib done on big needles with big yarn (16 sts over 4 inches). Theoretically, I should have been able to crank this sweater out very quickly, but with the move and my inability to deal with much of anything other than the move, I kept messing up the ribbing. I started this way back before we got the transfer in mid October and honestly, I'm ready for it to be finished. I've finished the back of it and once I finish the fronts, I'll have sleeves and the collar to do. According to Ravelry notes, most people flew through the body of the cardi, but progress came to a screeching halt when they began the cabled collar. I'm hoping it works out the opposite way for me (otherwise I'll NEVER get the collar done). Fingers crossed. I barely got any work done on the last Second Sock of 2008, but I'm still plodding along on it. I refuse to allow myself to start anything new until I finish that last sock. I've started the last of the Second Socks from 2008. As you can see, I've just started it. This is the Visions of Sugarplums sock and it's knit in a DK or Sportweight yarn. It only has 48 stitches around so it goes VERY quickly. I'd love to finish it up this weekend and have something new to show you on Tuesday, but everything seems to be taking longer than it should right now, knitting wise. I'm guessing it's just left over brain strain from the move. I've been thinking about designing and there might be another sweater design coming soon. I'm seeing some gaps in my wardrobe and once I figure out exactly what I want, I'll probably end up designing it. I still have some stole ideas floating around in my head that I need to get worked up and knitted, so don't worry if you love knitting stoles - there are more coming. Yesterday, when I finished writing the blog, look who I found in the sunshine. It was like he had read my blog post and wanted to prove that he could take over the sunshine spot*. So, here's your Finn fix! 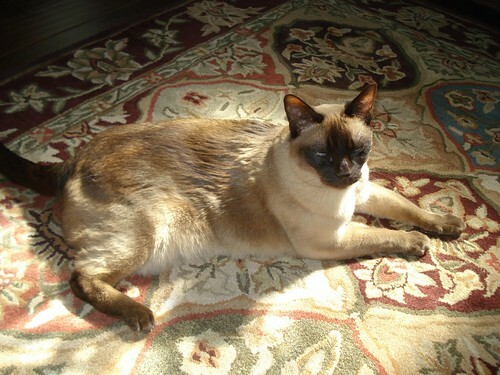 Both the sunshine and the rug seem to be very popular in the new house. Tomorrow I'll have knitting content again, I promise. * Don't feel too bad for Ramius, he found more sunshine somewhere else so he wasn't dying of hypothermia or anything like that - it's OK.
Ramius would say hello, but he's busy holding down the rug. 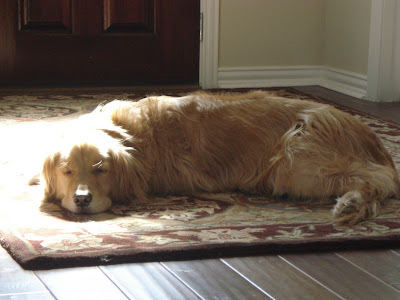 He quickly figured out that with the leaded glass on the front door, he could just follow the sunbeam across the rug all day. Once he had that part figured out, he pretty much had his day planned - all day, every day. Occasionally Finn moves him out of the sunbeam and takes it over himself (Finn is the only dog I've ever known to sunbathe like a cat), but Ramius gets it back before too long. Yesterday was a good day for my inner girly girl. I am just about out of perfume and I wanted to change scents, so I went online to try to narrow things down. One thing that caused some complications was the temperature change from Virginia to Dallas - something strong and heavy that would work just fine in Virginia in the Fall and Winter would kill people in Dallas during the same time of year, just because it's so much warmer. This meant I had to rethink scents a bit. Did you know there are perfume blogs? (I'm sure the people who read them regularly would be just as shocked that there are knitting blogs.) So I read perfume reviews here, and read about perfumes here and then I found The Perfumed Court which seems to be a collaboration of several perfume lovers who decant fragrances into various sizes of containers so you can (A) try them out in the privacy of your own home several times before purchasing without having to deal with Sales Associates who might or might not be helpful in providing samples and (B) get tiny amounts of super exclusive perfumes you wouldn't otherwise be able to find, smell, or afford. So I picked out a few things to sniff, ordered tiny vials and yesterday, they showed up in the mail! What did I get? Narciso Rodriguez For Her - This is supposedly also similar to Lovely, and I believe that some of the same people worked on both fragrances. I wanted to see which one I liked better. Bulgari Au The Blanc - Never smelled it, sounded interesting. I'm wearing it now and Finn gave it lots of wags and an attempted kiss - of course we won't discuss some of the other smells Finn likes. I also like it though, but will have to see what the menfolk think. Bulgari Au The Vert - This one also sounded interesting so I thought I'd give it a spin. Michael Kors Island - I smelled this in a magazine perfume sample once and for some reason I remembered it. No clue why I remembered it. For all I know it smells like seagulls, but since it rang a bell, I got a sample. So for the next few days I will be trying on various scents and making Mickael and Caleb sniff me (we are SO classy around here) and trying to narrow down a new scent. I'll let you know which one(s) I choose, since I've already started babbling about it on the blog. Second Sock Syndrome - Almost Cured! I'm on my second to last second sock! (Got that?) I originally had four socks that needed seconds - the originals to the Air - Elements Sock Pattern and the originals to the Visions of Sugarplums collection. 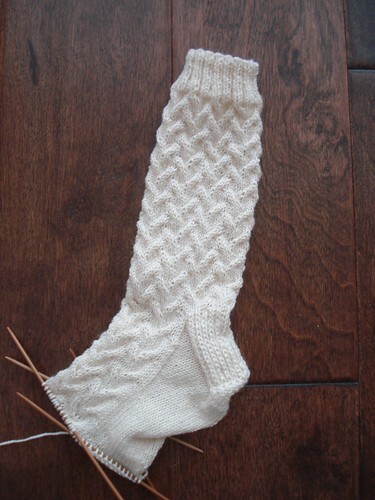 I've completed the Air second socks and as you can see, I'm almost done with the second sock for New Fallen Snow. Then it's on to the Visions of Sugarplums second sock and I'm through with second socks. Whew! I love this sock pattern - it's really easy and since it's an 8 stitch repeat, you can easily plug it into another size or gauge if you're making it for someone other than a woman with a medium foot (or using a yarn heavier than standard sock weight). I might make Mickael a pair of socks in this pattern (in a more manly color) because the texture of the stitch pattern reminds me of the texture that gets stamped into the steel on loading docks. I mean, can you get any more manly than loading dock socks? Didn't think so. I can tell you for sure though, that the next pair of socks I start will be a really easy stitch pattern (can we say "brainless"?) and I'll do both socks before moving on to another pair. I really wanted to start something new, but I could feel these second socks hanging over my head and I didn't want a guilt trip from a sock. Fortunately, I have sock time built into the schedule M-F in the pick up line to get Caleb. We live close enough to his school that he doesn't get bussed, but far enough that I feel like it's too far for him to walk. The new school has a pick up system that was probably developed by engineers with too much time on their hands. Our school in Virginia had a pretty standard pick up routine, but this one makes the Virginia pick up look like amateur hour. I won't get into details but let me tell you, when the school secretary was explaining the pick up routine when we signed Caleb up for the new school here, Mickael and I were pretty sure that we would be asked to home school him when we messed up the line on our first day. We were more stressed out about the pick up than we were about how much he actually liked his school! Fortunately, he LOVES his new school and we didn't mess up the pick up line. The way it works though, means I can either show up early and sit and knit and be one of the first to get my kid, or I can show up later and spend the time creeping forward as the line moves and not get any knitting done. The answer is clearly obvious here. 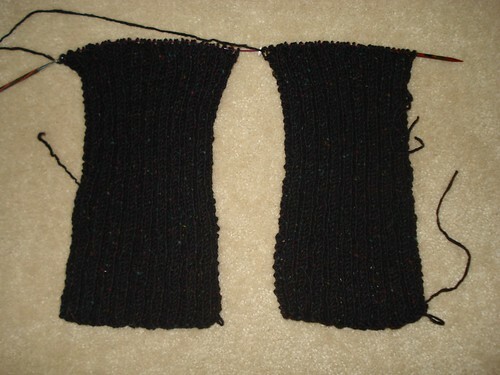 Hopefully I will finish this sock later today and then I can start the last second sock from 2008! Starting next Tuesday, I plan on resuming regular blogging! We've got 95% of things unpacked, dealt with, put away, and otherwise taken care of. By next Tuesday I will be ready to get back into a regular weekday pattern. One change I am thinking of making is to skip Monday's for blogging. Before everything got tossed around, rearranged, and crazy with the move, I tried to blog every Monday through Friday. Now that we're pretty much settled in, I realize that Monday will be more difficult to blog than other days. Monday's have always been crazy for me and I'm trying to work out every day, so with the added time of a workout on top of groceries, laundry, cleaning the house and all the other Monday things I do, it won't give me much time to blog. There might be an occasional Monday post, but for now at least, I'll just skip Monday and blog Tuesday through Friday. I'm about 1-1/2 socks away from finishing the second socks in the pairs I started last year, so I feel like I'm making pretty good progress there. When I was unpacking the sewing room, I felt like I was really ready to do some designing and explore some ideas I've had floating around in my brain but haven't had the energy to deal with. Maybe I unpacked my creativity! I still also have Juno on the needles right now. I think I'm on the fronts and I know that it will be a long time before I'll be able to wear it, but I want to get it finished up pretty quickly. Finn and Ramius have settled into the new house nicely. Ramius quickly discovered that the sun comes through the window on the front door and he follows it across the rug all day. Finn had some separation anxiety for the first week or two and would freak out everytime we'd leave the house, but we didn't make a big deal out of it, we'd just get him back inside (he was trying to go with us) and now he's back to his good manners when we leave. I'll get some pictures of them for the blog next week since I can't remember the last time they were on the blog. Have a great weekend and I'll be back Tuesday morning!